The Dramatic Growth of Open Access continues to astonish even this ever-optimistic open access enthusiast! As of today, November 28, 2007, the Directory of Open Access Journals (DOAJ) has added 80 new titles in the last 30 days. That's an average of 2.67 per calendar day! Open Access and Accessibility for the Print Disabled are two goals that fit together like hand and glove. In the online environment, it just makes sense to think about accessibility as we create information, rather than creating inaccessible information and building expensive services to overcome barriers that we have built later on. A document in XML or HTML is more accessible than one in PDF. A PDF that is not locked down with permissions, and not image-based, is more accessible than a PDF that is either locked down or image-based. The Budapest Open Access Initiative was not designed specifically to meet the needs of the print disabled; but a document that meets the BOAI definition of open access will be accessible for the print disabled, too. Similarly, when advocates for the print disabled convinced Adobe to build accessibility into their product (1), they were not thinking about accessibility for the rest of us, but their efforts have already (inadvertently) meant that many a PDF - whether published by a traditional or open access publisher - is much closer to meeting the BOAI definition of open access. This post includes a listserv message and comments, some from experts, and concludes with some final thoughts, including whether this might be considered a peer-reviewed listserv / blogpost, whether the publisher's PDF is, as often referred to, a value-add - or a value-subtract. This post began as a message to the SPARC Open Access Forum, ERIL-L, SSP list, liblicense, and Scholcomm. The above paragraph reflects modification based on comments by at least two experts on services for the print disabled, one publishing industry expert (private correspondence), and Peter Suber (on Open Access News. Comments posted publicly are listed below. For the print disabled, the difference between a PDF that is locked down and one that is not, is the difference between a work that is accessible, and one that is one. A locked PDF is an image file, with inaccessible text. An unlocked PDF has text that is accessible, that can be manipulated by screen readers designed for the print disabled. Even without special equipment, is it easy to see how an unlocked PDF can very easily be transformed into large print, or read aloud. Publishers, please unlock your PDFs! Librarians, please ask about unlocked PDFs when you purchase. If a country has a law requiring access for the print disabled, is it even legal to purchase databases with unnecessarily locked-down PDFs? The Budapest Open Access Initiative did not aim to meet the needs of the print disabled. This is just another side-benefit of open access. Corey Davis on ERIL-L: Thanks for the imperative Heather. I would also recommend that librarians look for databases that have multiple full text options, such as PDF and HTML. Having worked with the print disabled community for several years, I can tell you that PDFs--even accessible ones--can be quite problematic, especially when it comes to reading order. Adobe makes it possible to apply different types of restrictions to PDFs. Obviously, publishers don't use the most common type of "locking" which requires a password to open and read the document, and they don't impose restriction on printing. However, occasionally they may impose a more subtle form of locking, which makes a password necessary for "Content Copying or Extraction." This type of restriction is unnecessary and diminishes the utility of the article for scholars, teachers and students. Indeed, it makes it difficult for users to exercise some fair use rights. For example, it prevents a reader from taking notes by copying snippets of text to a personal journal. It also prevents a reader from copying a literature citation from a reference list (thus increasing the chances that an error will be made with manual copying). Also, it prevents a teacher from using Photoshop to rasterize an image (such as a chart, graph, diagram, cartoon or picture) within the article for use, for example, in scholarly research, classroom teaching, or in preparing to teach a class, as permitted by fair use. Publisher should not distribute scholarly articles with restrictions on content copying or extraction. Authors should inform publishers that these restrictions inhibit the fair use of their work. Peter Suber on Open Access News Exactly. If publishers insist on using PDFs at all, then at least they should unlock them. To facilitate re-use even further, they should offer HTML or XML editions alongside the PDFs. Heather's final comment and thoughts: This process reflects some elements of peer review, doesn't it? Could this be a peer-reviewed listserv / blogpost? We often talk about the added value of the publisher's PDF. If a locked-down or image-based PDF is a less useful than an XML or HTML file - is the publisher's PDF a value-add, or a value-subtract? March 31, 2017: data is available for download from the dataverse. No commentary post this quarter. Healthy growth in open access journals and articles published in them (thanks to Walt Crawford). June 4: the home page for Peter Suber's MIT Press book Open Access passed the milestone of 100,000 page views (I highly recommend this as an excellent brief starting point for learning about OA). The unstoppable growth of high quality open access resources - December 2013 early year-end edition. DOAJ notes that due to continuous improvement DOAJ has been deleting as many titles as it has been adding since August 2013. For this reason, DOAJ has been tantalizingly close to 10 thousand titles for some time. The unstoppable rise of open access. Spotlight by Peter Gruss, President, the Max Planck Society. BASE hits the 50 million record mark! SpringerPlus Journal (a new PLoS ONE clone) announced a milestone of over 1,000 articles (Comment - this tends to support my hypothesis of 2011 that open access has moved into an age of competition). Peter Suber posts DOAJ details and analysis including breakdown. DOAJ article search exceeds 1 million articles! - and for the first time more than half of the journals listed in DOAJ are provided article level metadata. Open Access Map - please help Ross Mounce build this visual approach to seeing the extent and growth of open access by adding repositories and other services that you know about. Megajournals - trading knowledge. Interesting blogpost on large open access publishing operations - some data, more qualitative background. 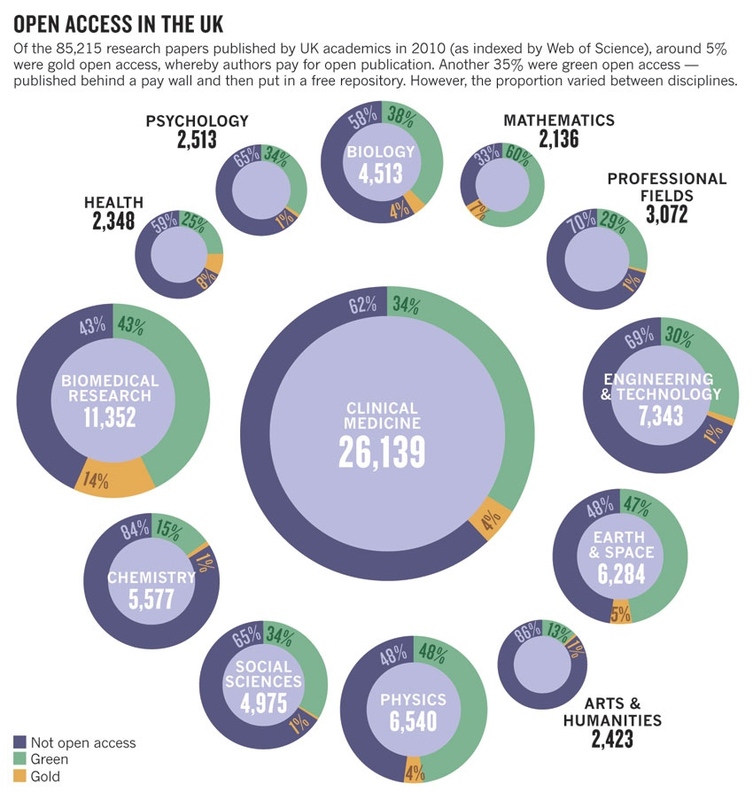 Open Access in the UK - graph from Nature illustrating difference in open access by discipline. Found that of the approx. 85,000 articles published by researchers in the U.K. indexed in Web of Science in 2010, 40% were open access as of 2012 - 5% gold, 35% green. (My note - Web of Science will tend to understate research activity in the humanities and social sciences). Data from Yassine Gargouri according to Alma Swan on the GOAL list. Mendeley Open Access update - Repository Man Les Carr congratulates Mendeley on a 47% increase in OA computer documents, reflecting an increase in participation. (Note: I haven't been able to find the full Mendeley OA count recently so have dropped them off of the Dramatic Growth of Open Access. Any tips on how to quickly figure this number would be most appreciated). Over 2.4 million articles are now in PMC. In addition to the NIH-funded papers deposited into PMC, publishers voluntarily deposit more than 100,000 papers per year. Every weekday, one half million users access the database, retrieving over 1 million articles. Based on internet addresses, an estimated 25% of users are from universities, 17% are from companies, and 40% from the general public. The growth of the PLoS ONE exceeded even the most optimistic predictions. In the first full year of publication it published 1,230 articles (making it larger in volume than all but about 100 journals) and, within 4 years, it became the largest peer-reviewed journal in the world. To date, PLoS ONE has published more than 28,700 articles and in 2011 alone it will publish almost 14,000 articles (meaning that approximately 1 in 60 of all articles indexed by PubMed for 2011 will have been published in PLoS ONE). Katarina Lovrecic Open Access year-end highlights: coming up roses? Walters, W. H., & Linville, A. C. (2001). Characteristics of open access journals in six subject areas. College and Research Libraries, 72(4), 372-392. Retrieved from http://crl.acrl.org.proxy.lib.sfu.ca/content/72/4/372.abstract. Good analysis of English-language DOAJ journals. Understates growth of OA, based on an article by Sally Morris. See here for critique of this approach. Those ACTIVE open access journals! Data from Ulrich's strongly suggesting that open access journals are more likely to be active than subscription-based journals from major commercial publishers. PLoS ONE: now THE world's largest journal? Polish version created by E-LIS Editor Bożena Bednarek-Michalska, which can be found here and here. During the week of October 4 - 8, 2010, open access and free journal collector extraordinaire Jan Sczcepanski collected his 10,000th journal. Thanks, Jan! Preliminary results of SOAP (Study of Open Access Publishing) Survey. At least 120,000 articles / year published as open access (this is about 8% of the estimated 1.5 million peer-reviewed articles published per year). Excludes non-english journals. 2010 is our 16th year and it is off to a great start. Our eLibrary (http://ssrn.com/search) has delivered over 37.4 million downloads to date and grown to 290,000 documents and 138,000 authors - increases over the last year of 53,000 and 22,000 respectively. Our CiteReader technology, developed with ITX Corp, has captured over 6 million references, 5.7 million footnotes, and close to 3.9 million citation links. We believe this growth in multi-disciplinary, open access content is exciting and contributing to innovative scholarly research in social science and humanities. PLoS One: Open Access to the Scholarly Journal Literature: Status 2009. Random study of 1,837 titles found of articles published in 2008, over 8% were open access on the publisher's website, and over 11% otherwise freely available, for an overall average of over 20% of articles freely available. There was a disparity in results by discipline. Project Euclid exceeds one million pages of open access content. Over 20% of world's scholarly journals are now fully open access - kudos to DOAJ! Notes February 3, 2010: Jim Tills' method for determining CIHR policy compliance, and more than 5,000 journals using OJS. Strong Open Access Growth Reported by Hindawi. Hindawi's figures for 2009 show more than doubling of submissions, and strong growth in accepted manuscripts, indicating that in addition to strong growth in number of OA journals, there is evidence of strong growth in articles within established OA journals as well. Update April 7: Open-access policy flourishes at NIH. Meredith Wadman. Nature News, April 7, 2009. Thanks to Peter Suber on Open Access News. Looking for downloadable data? Go straight to the DGOA Dataverse. Directory of Open Access Journals (DOAJ) Growth 2005-2008. Charts illustrated the growth in journal titles, journals searchable at article level, articles searchable at article level, and growth in growth rate for all measures in 2008. Gavin Baker presents more evidence of a spike in DOAJ in 2008. Factors to consider when considering DOAJ as an imperfect measure of open access journal numbers and growth are presented. Twice as much gold OA articles in 2008 as in 2006! DOAJ Over 200,000 searchable articles! DOAJ growth rate nearly doubles in a year. From 2007 to 2008, the DOAJ growth rate increased from 1.2 to 2.2 new titles, on average, per calendar day. Open Data Edition (showing quarterly and annual growth) - plus PMC free data, second sheet. More baseline data for PubMedCentral. Baseline data for PMC on the eve of the NIH new open access mandate, April 7, 2008. Cancer literature: 13% free. Baseline data for free full-text, before the NIH open access mandate takes effect. The Dramatic Growth of Open Access: Implications and Opportunities for Resource Sharing, Journal of Interlibrary Loan, Document Delivery & Electronic Reserve, 16, 3 (2006). 40 new titles added to PubMedCentral in the last 60 days! This post is designed to gather other posts and data editions of this series, and is backdated so that updates are not incorrectly identified as new posts. Is the Canadian Journal of Anesthesia asleep? Are the folks at the Canadian Journal of Anesthesia asleep? While Canada's main research funder in medicine, the Canadian Institutes of Health Research (CIHR), calls for open access to CIHR-funded research, the Canadian Journal of Anesthesia is among the small, and shrinking, percentage of journals that do not even allow author self-archiving! Canadian anesthesiologists: did you know that Harvard and Cal State do not subscribe to the journal produced by your society? Researchers there can read the articles, but not until they are a year old, unless they are willing to pay a temporary access fee of $20 US per day, for access at one computer. It seems unlikely that many researchers at Harvard or Cal State would purchase under these bizarre terms; in the developing world, these fees may amount to an enormous sum of money. If you're a member of the Canadian Anesthesiologist's Society, please tell your society to ask the folks at the journal to wake up, and realize how much Canadian anesthesia has to gain by moving to the optimal dissemination that is open access! Grant recipients are now required to make every effort to ensure that their peer-reviewed publications are freely accessible through the Publisher's website (Option #1) or an online repository as soon as possible and in any event within six months of publication (Option #2), you will be looking for a journal that is open access, or to least allows authors to self-archive their work as open access, in which to publish. If you look at the Directory of Open Access Journals For Authors page, which lists full or hybrid open access publishing options, you won't find the Canadian Journal of Anesthesia here. If you check the SHERPA RoMEO Publisher Copyright Policies and Self-Archiving site, you won't find the Canadian Journal of Anesthesia here, either. Okay, so your research funder requires that you make the peer-reviewed research articles open access, but it is not possible to do this if you wish to publish in the Canadian Journal of Anesthesia. There are other reasons for publishing, of course. You want impact. That is, you want other researchers to read and cite your work. What does publishing in the Canadian Journal of Anesthesia accomplish here? According to the Canadian Journal of Anesthesia's information for advertisers, advertising in the Canadian Journal of Anesthesia is the best way to reach Canadian anesthesiologists. What about outside the U.S.? If you are a researcher at Harvard or California State University and wish to view a recently-published article from the Canadian Journal of Anesthesia, you will not be able to do so. The Canadian Journal of Anesthesia is included in Highwire Free; but articles are not available here until they are at least a year old. * Pay per Article - You may access this article (from the computer you are currently using) for 1 day for US $20.00. This is mind-boggling. $20 per article, and only 1 day's access from 1 computer? If you start reading an article at the hospital library, get called away to attend to a patient and want to continue reading from your office, you're expected to pay again? If you're a Canadian and the article is funded through Canadian taxpayer dollars, this is particularly offensive, as you have already paid for the work. If you're a researcher or practitioner in the developing world, this may be an enormous sum of money. If there is another article you want to read and it is in an open access journal or open access archive, you can download again and again to as many computers as you would like. If your time and attention is limited, what will you read? No wonder there is such an impact advantage with open access! Even if an author wishes to consider subscription journals with no open access policies to publish in, why choose the Canadian Journal of Anesthesia with its circulation of 4,000, when Anesthesiology has a circulation of 38,000? Not to mention that Anesthesiology is obviously experimenting with free sample articles for current issues, too. Here is an hypothesis: all else being equal, the open access impact advantage should correlate inversely with journal circulation. The smaller the circulation, the bigger the OA impact advantage. If Canadian researchers are not interested in research funding and/or do not care about the people who provide the research funding (the Canadian taxpayer), and do not care whether anyone reads their work, by all means - go ahead and publish in Canadian Journal of Anesthesia, if you are aiming for obscurity. On the other hand, if Canadian anesthesiologists wish to make an impact - on the world, on their research funder and the Canadian public - please tell your association to wake up, quit publishing for a few anesthesiologists in Canada, and go for the optimal dissemination that is open access! This post is NOT a part of the Canadian Leadership in the Open Access Movement series. Perhaps a future issue? It is important for those of us who have been advocating for open access for many years to remember that there is still much work to do educating people about what open access is; from time to time, let's remember to get back to the basics. As open access mandate policies are developed, we need to watch for, and correct, misunderstandings. The only element missing from this definition, is that true open access means that an item is available open access immediately on publication, not after a delay period. The literature that should be given away for free, is the literature that scholars have always given away for free. Scholars traditionally give away their peer-reviewed journal articles. Peer reviewers are not paid for their work, either. Open Access Archiving (or the green approach): the author (or someone representing the author) makes a copy of the author's work openly available, separate from the publication process. That is, the article may be published in a traditional subscription-based journal. The version of the article that is self-archived is the author's own copy of the work, reflecting changes from the peer review process (all the work that is provided for free), not the publisher's version. Open Access Publishing (or the gold approach): the publisher makes the work open access, as part of the process of publication. Research funders' policies requiring open access always apply to the recipient of the funding, the author. Policies either allow either approach to open access, or they specify the open access archiving, or green approach. The green approach is broader; an article published in an open access journal is available for deposit in an open access archive. Therefore, a green open access policy provides for either approach to providing open access. Thanks to Peter Suber and Stevan Harnad for pointing out the need to focus on restating the basics of OA. Many faculty members are currently encountering one of the sillier disadvantages of the toll-access approach in the internet-based world. That is, the decreasing usefulness of articles with the restrictions of licensing. An article that one might have put on reserve as a print copy, or handed out in class as print, without a second's thought, may well be forbidden, or much more complex to provide, in the online environment. Librarians, this is a teachable moment! An article that is truly OA as per the Budapest definition, CAN be placed on e-reserve or distributed in coursepacks, either as a link, or as the full content of the article - with attribution, of course, but with no frustrating, time-wasting and often costly process of obtaining permissions, or dealing with the complexities of authentication or re-authentication to connect student with article. For example, no permission at all is needed to link to each and every article in the latest First Monday, a special issue devoted to papers arising from the First International PKP Scholarly Publishing Conference. In such a situation, the simplest, most fulfilling, and lowest cost solution may be, after searching for an OA copy, is for the teacher (or librarian) to contact the author and ask whether self-archiving might be a possibility. For that matter, the more we promote resources like DOAJ, OAIster, Scientific Commons, etc., the more faculty will see for themselves this particular benefit of OA. This can only increase the tendency for faculty to want to seek out OA resources, and publish OA themselves - a positive cycle. Why Yet Another Positive Cycle? Because the first potential positive cycle is OA through article processing fees decreasing subscription costs, freeing up funds for more article processing fees and other OA support, and so on. Any opinion expressed in this e-mail is that of the author alone, and does not reflect the opinion or policy of BC Electronic Library Network or Simon Fraser University Library. It should be noted that even with print, there are differences in generosity to the user with 'Fair Use' in the US, and the more restrictive 'Fair Dealing' in Canada and the UK. Even with Fair Dealing, however, there are often greater restrictions with electronic than print.